Navigation in Peggle: Dual Shot is a simple and intuitive interface. The opening credits contain a video which is a little long, but it can be skipped. Download time is average. The demo is located under the "Extras" menu which, while it fits, might seem confusing to new players looking under the multiplayer "Duel" option (which involves system-passing "Hot Seat" style gameplay, but not Single-Card Download). The demos are clearly labeles with sufficient buffer space, and all tapping within is accurate. There are two ways to aim in Peggle Dual Shot: by using the stylus and by using the direction pad. Both options are very accurate in two very different ways. Targeting with the direction pad moves the shooter in such small movements that it's easy to work the aim in between tight spots. Targeting with the stylus aims the shooter exactly where you drag it/tap it to, and if you hold the stylus to the screen for a couple of seconds, the game will zoom in (with the enhanced area on the upper screen), shrink the movements for accuracy, and allow for fine tuning before firing. The actual act of shooting - by tapping the shooter or by pressing the "A" button - acts exactly the same either way. Graphically, Peggle Dual Shot looks exactly as it should, being a 2D puzzle game with 3D elements. The colors are bright and vibrant and, while the game looks pixelated when zoomed in, it comes across as an intentional creative decision to uphold the honesty and accuracy. The sounds are mostly sound effects and Extreme Fever celebratory music (an intentionally over-the-top rendition of Beethoven's "Ode To Joy" / "Symphony No. 9 in D minor, Op. 125 'Choral'"). Only one basic level is offered up to send as a demo. Before playing Peggle Dual Shot, I had never been exposed to the Peggle Universe. Every time I told someone the game had Single-Card Download (or would have it, before its release), I got "Ooh! Peggle! I LOVE Peggle!!" Needless to say, the game is a fantastic action puzzler. I played through the demo probably 40 or 50 times, until the entire list of Top 5 scores was over 400,000. The constant "But This Game!" reminders got annoying, but didn't deter me from replaying it over and over again. Generally, at this point, someone enjoying the game would buy it (or rent it, etc.) and not keep playing the demo, and thus wouldn't have to keep looking at the sales pitch. I highly recommend this game as one of the best action puzzlers in the Nintendo DS library. 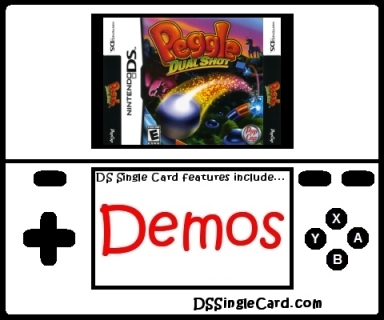 Give the downloadable demo its own option on the main menu ("Send Demo" or something similar). Make the multiplayer Duel mode Single-Card Download play compatable. Allow owners to send any unlocked level as a downloadable demo. Include a level creator (that monitors fairness and balance) and make user-created levels available via Single-Card Download.